First announced in late 2017, AirSwap, a ConsenSys project, is one of the most talked about decentralized exchanges for Ethereum and other ERC20 tokens today. 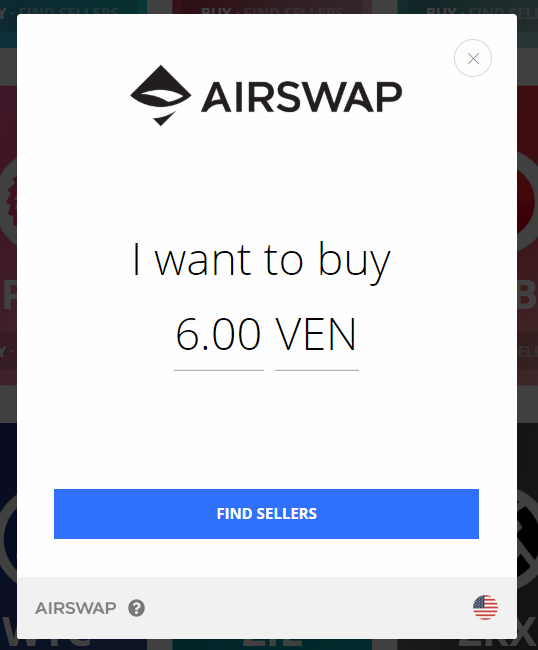 The AirSwap Marketplace, the feature which actually allows you to trade tokens recently went live on April 27, 2018. Since that feature is now live, we at CoinGecko figured that it’s a good time for a comprehensive beginner’s guide to using AirSwap. 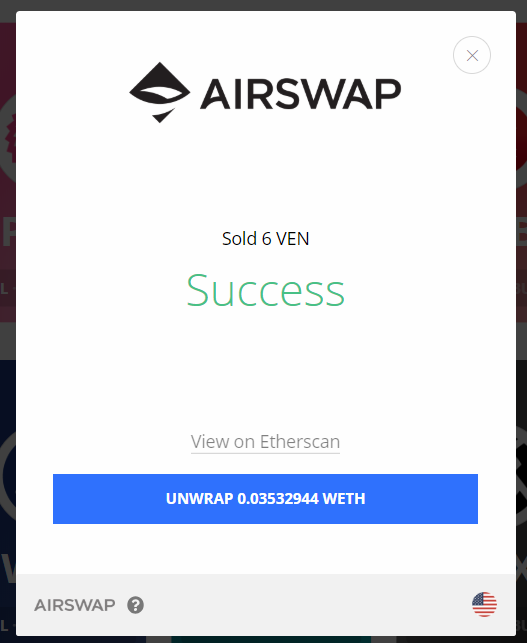 This guide will explain what AirSwap is all about, how it works, and more importantly how you can use it to quickly and easily trade ETH and ERC20 tokens. Let’s begin with a quick explanation of a decentralized exchange. 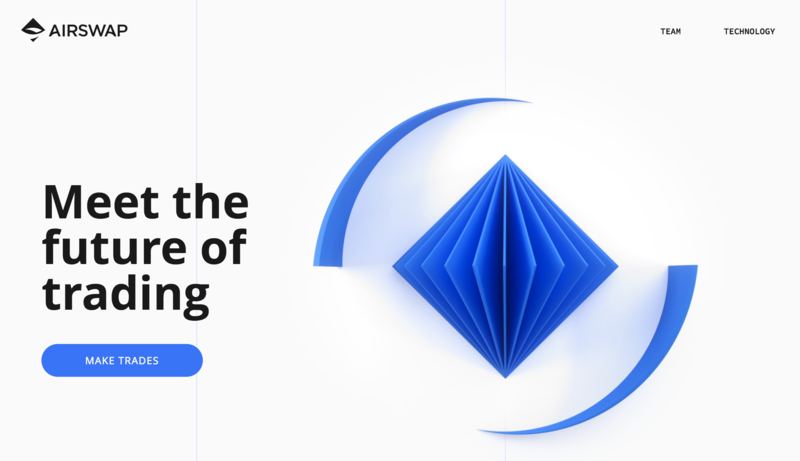 Although the base philosophy behind cryptocurrencies is decentralization, in order to facilitate large scale trading, most crypto exchanges still operate on a centralized model. This means that the exchange holds custodial control over your funds and manages a central order book for matching trades. No custodial control of funds: Decentralized exchanges use a peer-to-peer model so users exchange funds directly with each other. In that sense, decentralized exchanges are more of a ‘matching service’ than an actual exchange. This means that there are no funds stored by the exchange for hackers to target. Higher anonymity: The level of KYC (Know Your Customer) requirements to use decentralized exchanges are typically far lower than centralized ones, resulting in increased privacy. Less susceptible to external control: It is very easy for regulators to shut down centralized exchanges, but near impossible for that to occur with decentralized ones. Nonetheless, there are also some downsides to the decentralized exchange model. In general, the level of liquidity is far lower compared to centralized ones and so is the number of features. For example, common trading features such as stop-loss, lending, and margin trading are currently unavailable on most decentralized exchanges. Note that many decentralized exchanges, although not holding custodial control over funds, still have a centralized order book for matching purposes. AirSwap does not do this but implements a full peer-to-peer model for both trading and order matching. Its order matching system is an off-chain ‘Indexer’ in which market makers can post ‘intents to trade’ for specific tokens but with no exchange rate. Only when a match is identified does the protocol move to negotiation. In that respect, AirSwap’s Indexer is for ‘counterparty discovery’ rather than ‘price discovery’. The price discovery only happens during the settlement phase of the transaction, which takes place on-chain. The transaction itself is executed via smart contract. This private price negotiation is one of the main things that set AirSwap apart from the competition as it allows for front running protection and dark pool trading. More information on AirSwap’s Swap Protocol can be found on its whitepaper here. What’s the Use of the AirSwap Token? Note: The utility of the AST is mostly designed for market makers. 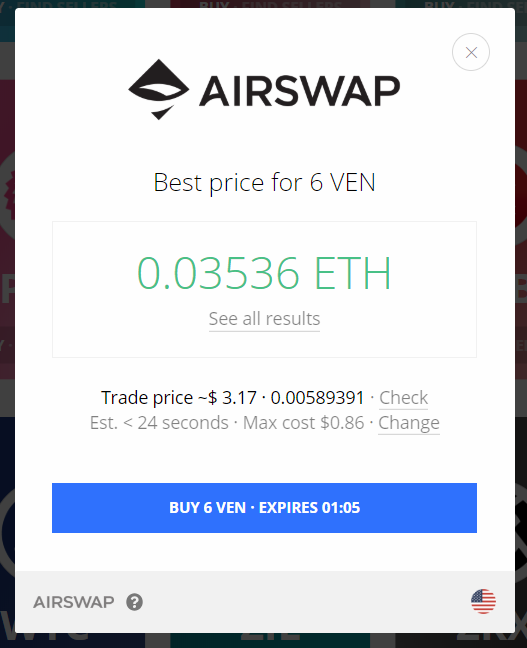 Hence, if you’re a beginner who just wants to do simple trading on the AirSwap platform, you may want to skip this section. However you can still opt to buy and trade AST based on its value. Different decentralized exchanges use different models to enable peer-to-peer trading. The creation of proxy tokens is one common model and it’s one that AirSwap uses. 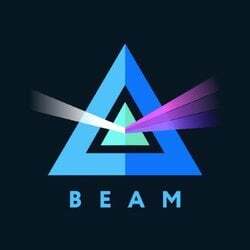 It has the AirSwap Token (“AST”) that allows holders to act as market makers on the platform. Note that market takers do not need to hold any AST to use the platform, but only pay Ethereum gas fees. Market makers on the platform need to purchase and lock up AST for a specific amount of time for each ‘intent to trade’ you want to post. After the trade is completed, the AST is unlocked; no tokens are burnt. The advantage of this ‘locking’ model, which is essentially a feeless model, is to allow institutional scale market makers to run large bot networks and trading algorithms without having to pay excessive fees. This is a huge incentive intended to boost liquidity on the platform. At present, one single ‘intent to trade’ requires 250 AST to be locked, which must be used over 7 days. In addition, AST holders also have voting power over the platform, meaning they can vote to change the locking mechanism. This gives flexibility to platform’s economic model. As of 26 June 2018, AST has a market capitalization of about $20m, ranking it 317th among all cryptocurrencies in terms of market cap. One AST trades for $0.136, meaning that one ‘intent to trade’ will cost about $34. At the time of this writing, it appears that if you want to be a market maker or liquidity provider on AirSwap, you will have to contact them directly as per their FAQ. Another option that is currently available to become a market maker on the platform is by using their API which you can find on GitHub. The public frontend interface that will enable the market maker function through locking AST has yet to be released. Based on AirSwap’s roadmap, this functionality is expected to be released in Q3 or Q4 2018. 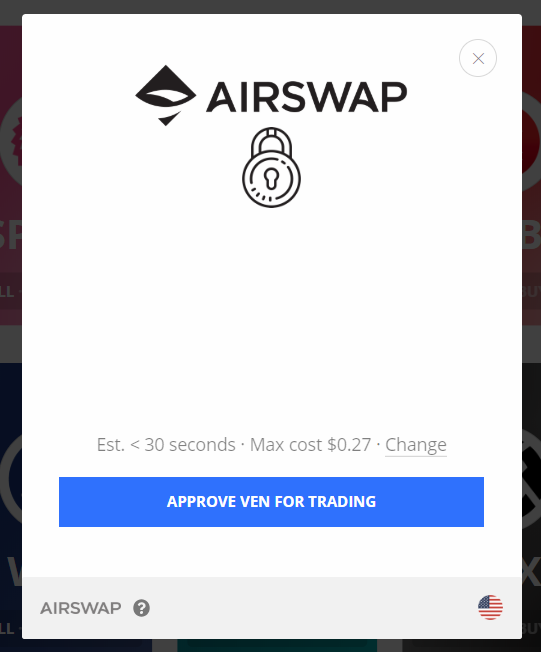 The first thing you will need to trade on AirSwap are compatible wallets. At present, AirSwap is only compatible with Ledger, Trezor, and MetaMask. Note that for the purposes of this guide, I will be using my MetaMask wallet. 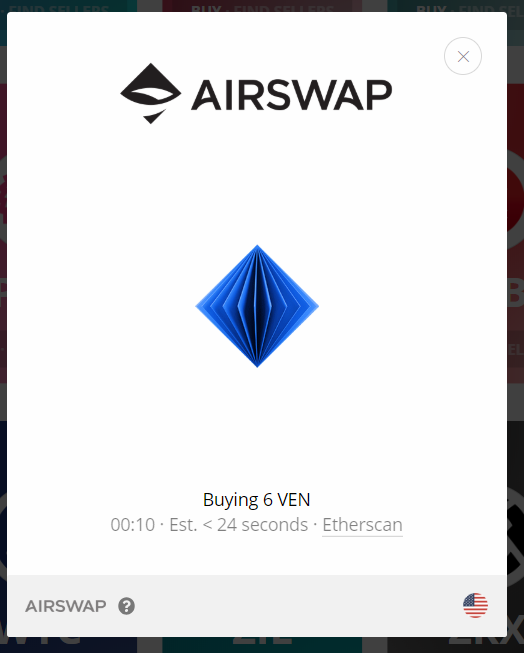 First head over to https://airswap.io/trade and click the ‘Sign In’ button at the top right of the page. A pop up message will then appear giving you the option of the three wallets mentioned above. Do note that you have to first unlock (i.e. sign in to) your MetaMask. Once you’ve signed in, you can see an easy-to-use interface for both buying and selling tokens. At the time of this writing there were 64 tokens listed on the page. You might have noticed that ‘UNWRAP WETH’ button at the top right hand corner of the page. 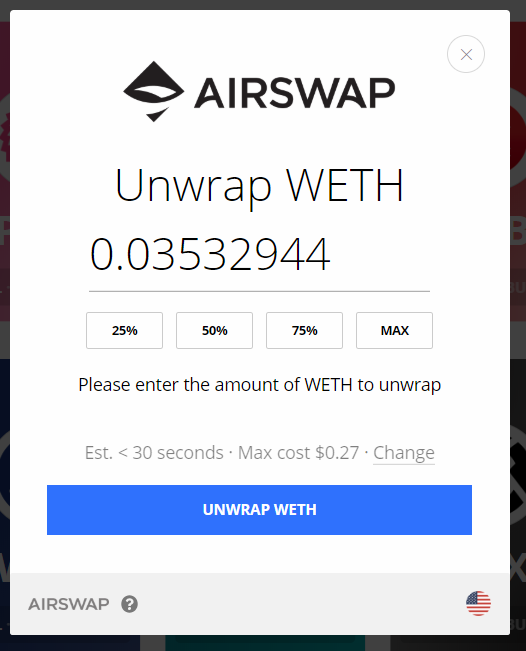 WETH stands for Wrapped-ETH and its function is a token that allows you to trade ETH directly for other ERC20 tokens on decentralized platforms such as AirSwap. ‘Wrapping’ ETH has it is called, is basically just exchanging ETH or W-ETH tokens and ‘unwrapping’ tokens is the other way round. Now let’s try buying some tokens with my ETH. For the purposes of this guide I’m going to buy some VeChain (VEN) which trades for about $3.15. 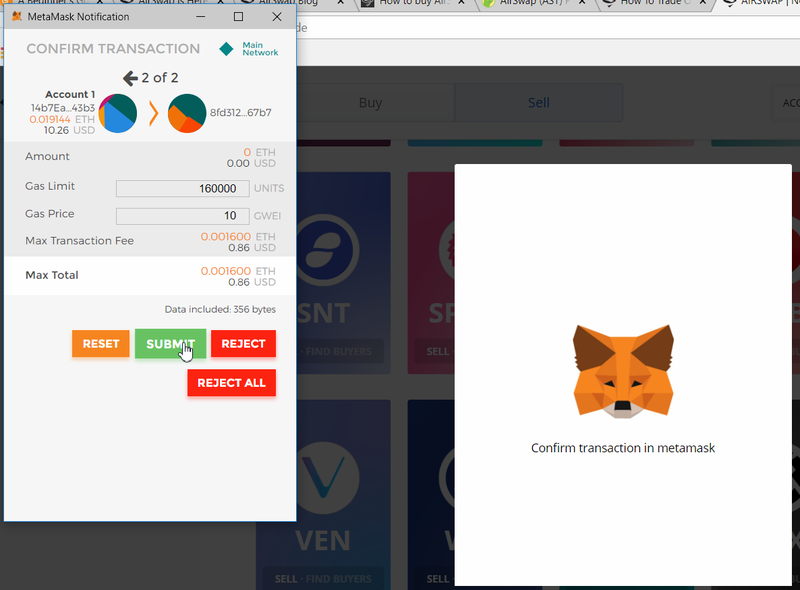 Once I clicked the Buy button, I had to confirm the transaction on my MetaMask account. And that’s it! Here’s the transaction on Etherscan. Now let’s say I want to sell the VEN I just bought. I had to approve it for trading, and confirm it on my MetaMask account. 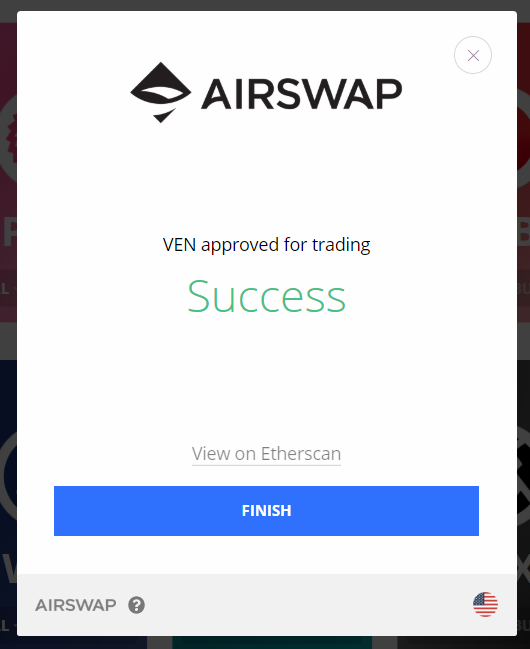 Now my VEN is approved for trading. 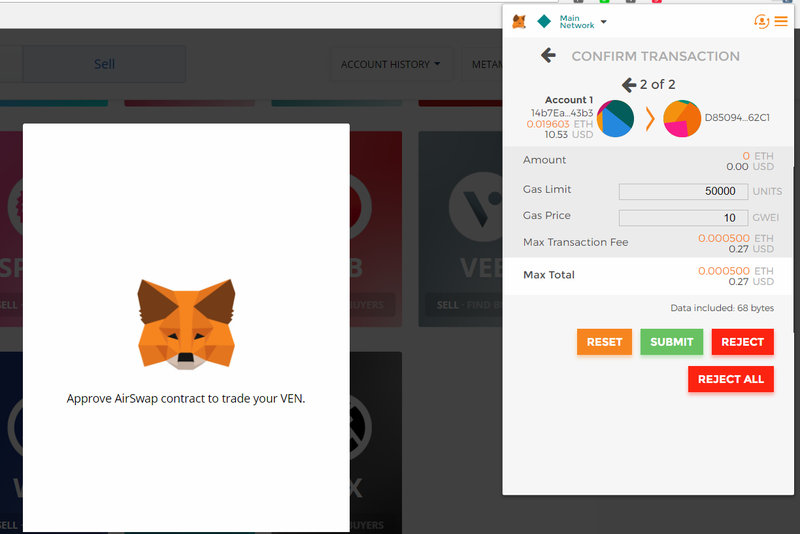 I’m going to sell all the VEN tokens that I just bought. Here’s the transaction on Etherscan. 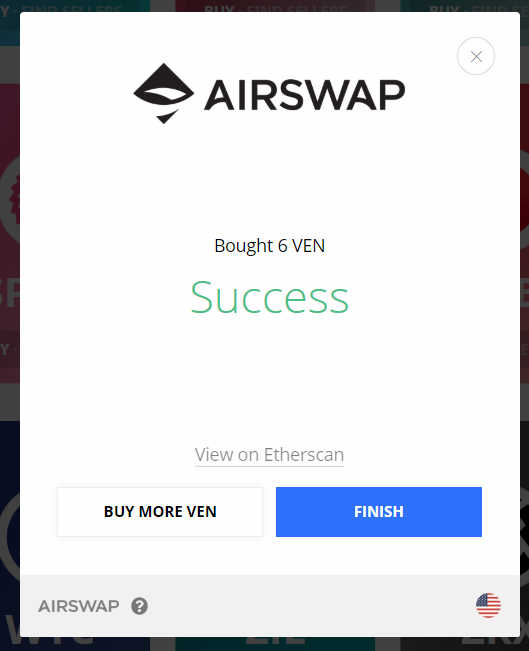 Do note that the VEN I sold for ETH is held by the AirSwap Protocol in the form of W-ETH, as I talked about above. If I want to have the ETH back in my MetaMask wallet I will have to unwrap said W-ETH by clicking on the button above. 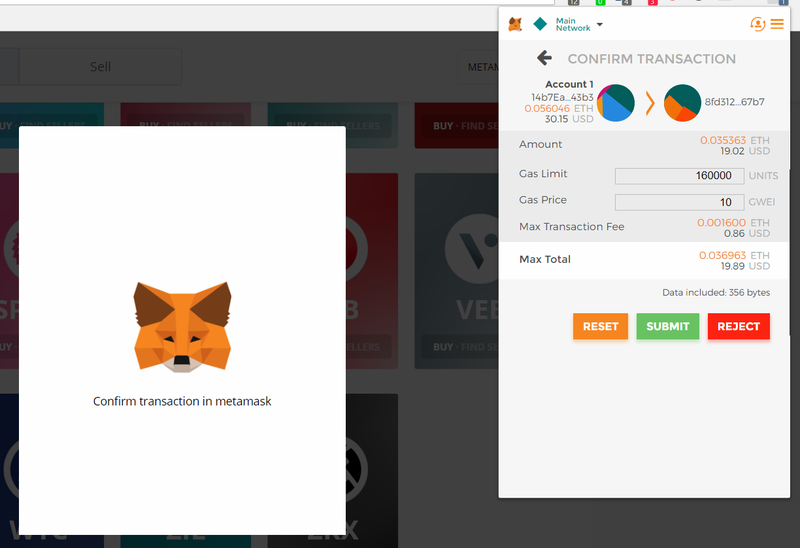 Once you click unwrap, you will again have to confirm it on your MetaMask wallet. On Etherscan, this transaction will show up as an ‘Internal Transaction’. That’s basically it. 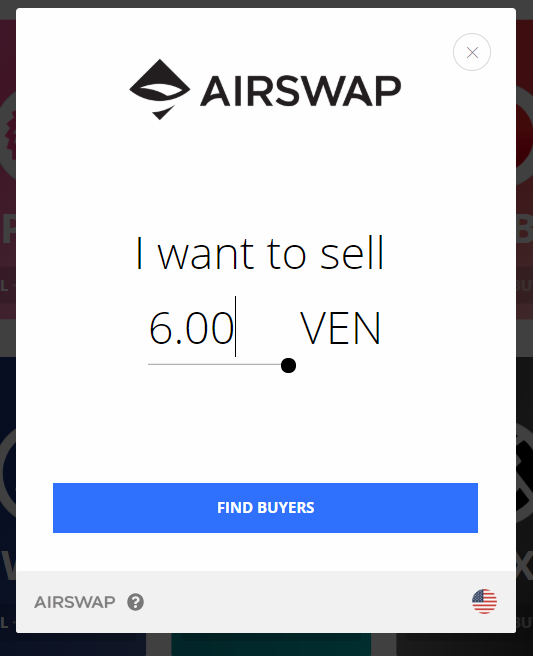 Buying and selling tokens on AirSwap is super easy and anyone should be able to figure it out within a matter of minutes. I also liked that although my trade amounts were very small, the platform was able to find buyers and sellers within seconds. One common criticism levelled against decentralized exchanges is that they are difficult to use, particularly for beginners. As you can see from the above, that is definitely not the case for AirSwap. 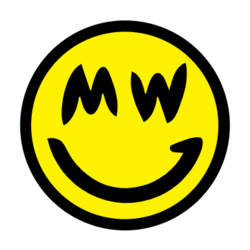 Even as a brand new user to it, I was able to buy and sell tokens with no problems whatsoever thanks to its intuitive and easy to use platform. Of course, while AirSwap is very user friendly, its primary objective appears to be to attract large market makers, particularly large financial firms that may be unable to enter the cryptocurrency markets at present. The co-founder of AirSwap is Michael Oved, who helped Virtu Financial become “the most consistently profitable market maker in the history of electronic trading”. That said, AirSwap is obviously not neglecting retail investors in its setup and has made it as simple as possible to use for them. As more market makers come on board to provide more liquidity to the platform, it will similarly attract more retail investors as well. It will be interesting to see how AirSwap does in 2018; it appears to truly have the potential to become one of the biggest if not the biggest decentralized exchange on the market today.